Fresh from its launch in 2014, Ultra South Africa through its recently launched Huawei Culture Club is fast growing into one of South Africa’s top platforms for fans to access the best music and entertainment events around the country. Ultra Music Festival, the World’s Premier Electronic Music event, is an internationally renowned event that was launched in 1999 in Miami, Florida. The inaugural Ultra South Africa was brought to the country by Electric Music. Huawei South Africa has also confirmed its official sponsorship of the second edition of Ultra South Africa. Ultra is one of the world’s most powerful dance events and the South African edition is set to thrill electronic dance music fans across Cape Town and Johannesburg. “With Ultra being the largest Electronic Dance Event in the world, it falls in line and resonates with our brand. Huawei encourages people to Live Large and experience life boldly. Like our latest large screen devices, Ultra allows you not only to broaden your horizons but also to see more, do more and experience more” – Yudi Rambaran, Huawei’s Product Marketing Director South Africa – Jan 2015.
International headline artists include Armin van Buuren, Axwell^Ingrosso, Hardwell, Martin Garixx, DVBBS, Gorgon City and Oliver Heldens. Black Coffee, Dean Fuel, DJ Fresh, Euphonik, Goldfish, Harael Salkow, Household Funk, Kent, Kid Fonque, Krazyboy SA, Kyle Watson, Kyle Worde, Mark Stent, Nick Essential, Pascal & Pearce, Phat Jack, Pimp Squad, Protoculture, Ricardo Da Costa, Richard Marshall, Roger Goode, Vimo + many more. The Huawei Culture Club will take place on the following dates…..
JOIN THE FAST GROWING HUAWEI CULTURE CLUB! 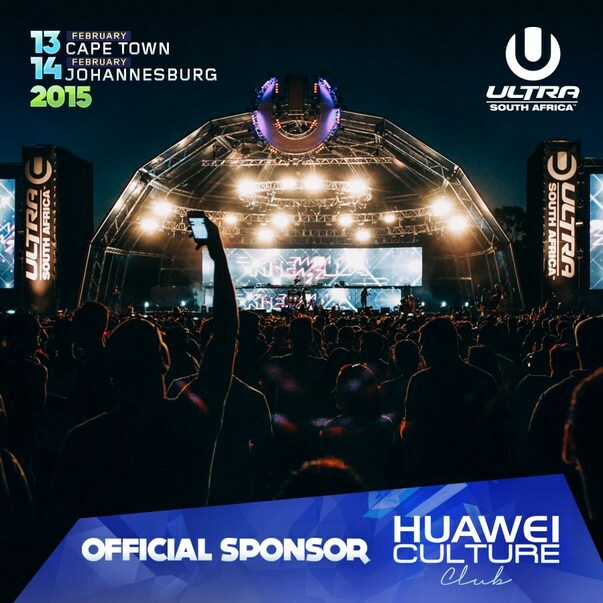 Huawei’s sponsorship of Ultra South Africa means that Huawei Culture Club users have immediate access to exclusive Ultra ticket discounts, giveaways, DJ content and news through the Club’s digital app hub and physical experiential zones at the events. 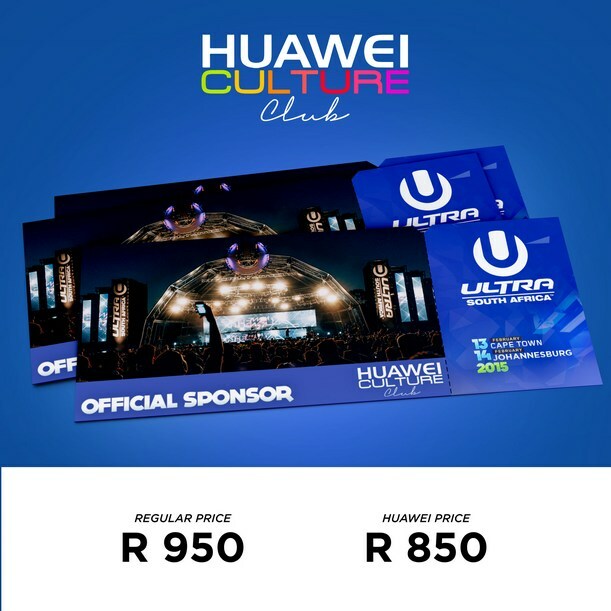 As its first offer to Ultra South Africa fans, the Club is offering a R100 discount on all Ultra tickets purchased through the Huawei Culture Club app (limited quantities). Download the Huawei Culture Club App from the Google Play Store to secure your Ultra ticket discount and chances to win. Editor’s Sidenote: The app will soon be available on iOS.